Anybody else think our current glider design looks eerily similar to the one used by Nausicaa? 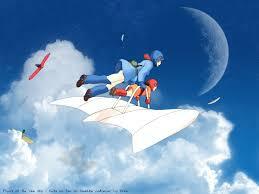 Kami-Kahzy wrote: Anybody else think our current glider design looks eerily similar to the one used by Nausicaa? You think it looks like this? The design is indeed similar, though the body is made mostly of weather-treated silk and canvas stretched over a frame of wooden struts. Reza simplifies it for easier drawing so it looks more like sheet metal. The round 'belly' houses the floater core. It can be used to help with starts and landings but it would be too draining to use only that to fly on the mana poor surface. Which was why the suggestion to convert the floaters into gliders was made in the first place. If this prototype works out well you can start converting more floaters into gliders, as long as the materials last. 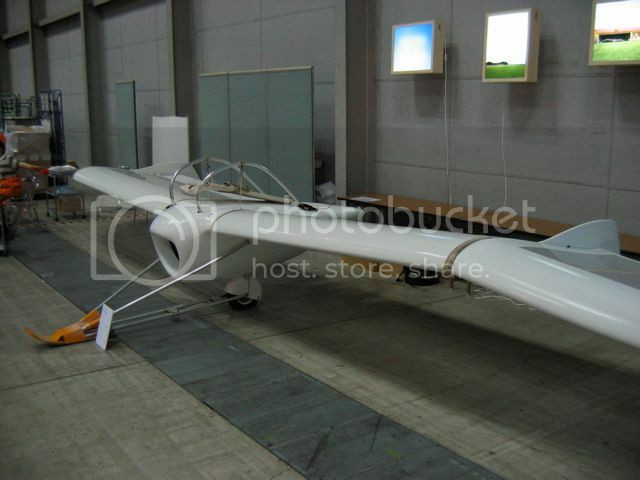 suntiger745 wrote: The design is indeed similar, though the body is made mostly of weather-treated silk and canvas stretched over a frame of wooden struts. Reza simplifies it for easier drawing so it looks more like sheet metal. Actually Originally the gliders were supposed to be JUST Gliders. Like Hang gliders for like recon and stuff. Glide down. Disassemble. Recon/scout area. Fall back. Gather disassembled glider, Meet up with Main force/Air ship. The gliders are just gliders, correct. The floater core was added as a means to get it off the ground and catch a breeze so it could be flown back to the ship and for short term lifts in a pinch. Hopefully Suntiger has seen the diagram on the previous page with my improvement suggestions. If the pilot is going to ride on top, then the lower body should be set up so the center of gravity is just below the wings for stability in flight. And if we're going to have to deal with flying lizards I guess arming the things will have to come sooner than I planned. But at least your design makes arming them a whole lot easier than my version. Whenever Suntiger and Kern say we've worked the bugs out of the hang glider, parachute, and/or body glider we'll make three more hang gliders. I think four will do the job for us for now. We can suspend them from the ships air bag rigging to save cargo deck space. If Anjahli want's to send the glider out for recon and someone wants to volunteer I can't stop them. But I'd prefer that untethered flights be held off until the stability issues are resolved and the parachute system developed. 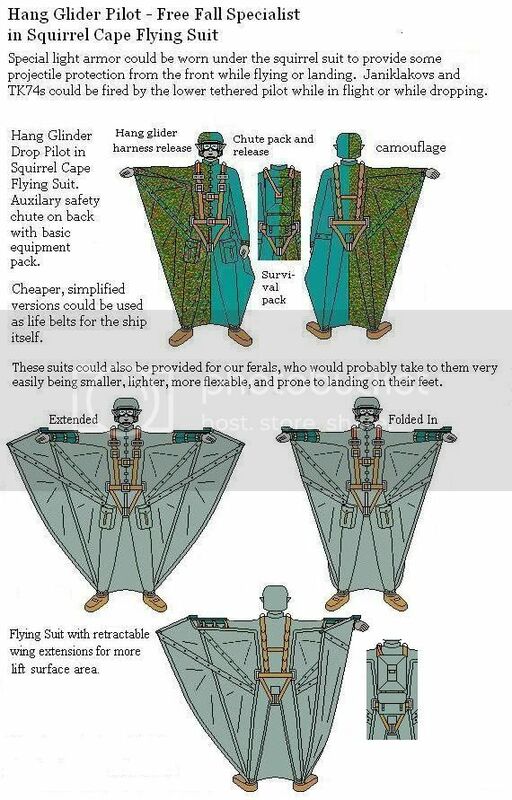 We also need it to be shown that the pilot is held on by a safety harness. Timotheus wrote: Hopefully Suntiger has seen the diagram on the previous page with my improvement suggestions. If the pilot is going to ride on top, then the lower body should be set up so the center of gravity is just below the wings for stability in flight. And if we're going to have to deal with flying lizards I guess arming the things will have to come sooner than I planned. But at least your design makes arming them a whole lot easier than my version. Um... let's try to make as many as we can manage before we try arming the one we have and bringing it into a dogfight against creatures with vastly superior technology and experience. And to be honest, I'd prefer doing everything we can to not get into a fight with dragons at all. It is better to have the capability and not use it than to need the capability and not have it. Even if it's just that the gliders have the auto cross bow mounts built in them and we have the cross bows ready to install if needed. I'll also be doing a larger illustration of the arm-wing extenders for the Squirrel suits in reply to the comment in the EA panels about their lack of lift.